So let's resume with our newly beamed warp. I laced onto the front beam and slid my lease sticks to the back beam. They are there just in case something needs 'fixing'. If all is well, I pull them out. I had threaded, and sleyed the 2/8 cotton to 20 epi. This sett is the one normally recommended for this grist of cotton and plain weave/ lace. Using a ten dent reed, I sleyed where the flowers are to be at 2 per dent (or 20 epi) but there is special denting required for the mock leno. Sley the three ends together, leave an empty dent and continue. It was far too open and stringy looking. I checked the cone I took the warp from and it's Earth Guild 8/2 cotton, 3200 yd/ lb. There's the problem right there! Canadian 2/8 cotton ( we switch the numbers around but it means the same) is visibly thicker. So I had to resley the entire warp again but this time I used a 12 dent reed. Two ends per dent for the flowers and the required 3 and empty dent for the mock leno. It tightened everything up a bit. But not too much as this is meant to be a light and lacey piece. The back of the cloth is a perfect reverse of the front. The flowers are actually more obvious on the back, but you' won't see that side of them when until the warp comes off the loom. The plan for this warp is two runners at roughly 48 inches long including hems, plus one smaller side table cloth at 27 inches including hems. There is also some allowance for samples for sharing. I have woven 2.5 inches in plain weave for the first hem, then hemstitched. Placed a thick spacer and then hemstitched the opposite side and now weaving alternate bands of leno and then flowers. I'm using a temple to minimize draw in and it's coming along nicely. But in the mean time I have to go ride my other vehicle. There's a overgrown lawn here somewhere with my name on it. Notice: the tractor gets the carport and the mini van doesn't. The plan is (for now) to use 2/16's mercerized cotton in white as warp. The sett will be 36 epi. Weft will be either 2/30 linen weft in either white or natural, or 2/16's in unmercerized cotton in natural. There should be a subtle play on light to see the pattern. The deadline is woven goods to the Sample Hostess by Oct 31st. Even if I change my mind, I'll be using the 2/16's so will start winding the warp soon. If you have never participated in a weaving exhange, give it try when one is available. They are like 'Christmas' when they are over. You get back some totally different ones back and they in turn become like useable samples as they have the weaving drafts accompany them as well. Some of the weavers guilds I have belonged to over the years have ocassionally done this, or it can be a small private group of weaving friends who coordinate an exchange. I still have kitchen towels in use from my last one and it's like having your friends with you every day. This post will address my special method for putting a warp on my loom. It's my creation but if you think it might work for you, then by all means give it a try and good luck! I like to weave warps somewhere between 4 and 12 yards depending on my project. I can't get enough interest to weave any thing longer than that as I seem to become incredibly bored with the repetition. I need to have variety! This means that I beam more warps but that's not a problem for me as I call each stage 'weaving' and have learned to appreciate that individual part of the process for its own sake and not something to endure to get to the good parts. I prepare my projects on paper and part of the planning is to create the warp based on what ever the epi will be. If that number is uncertain, I will judge where I feel the middle ground is and base the epi on that. This current project is 20 epi and so I wound 26 one inch bouts of 20 epi on my warping board (all tied and secure with a loop through the cross) and one additional bout of the final ends. I'm using 2/8 merc cotton and so this would be an appropriate sett for this yarn to achieve a balanced plain weave. But this pattern has areas of lace like floats and mock leno so all bets are off! Here is a picture of the warp bouts hanging on a rack beside my loom waiting for their debut. I wind the warps ahead of time and have them ready to go. I like to beam back to front and have done so for years. Its easier on finer yarns and my back! My loom's set up is best suited for this as well. Since my loom has a sectional beam, I place my tension box on the back rail above the 'working one inch' farthest to the right side of the loom. I will work slowly leftwards winding on one inch at a time. I attached a long leader cord to the sectional beam which will extend the warp right up the back of the heddles and reduce the loom waste. I allow for 21 inches loom waste but it rarely goes over 15 inches. I then attach the warp bout by a larks head knot to the cord and position it up and over the back beam and onto the tension box, placing the cross over the pegs. I position the cross loop cord over some pegs too to keep it out of the way while winding on. I then separate the two layers of warp by running my fingers through it back to the first tie to reduce any tangling and then slowly beam on by hand turning the sectional. I use an even but firm pressure as I slowly turn. I have sectional separators that I could snap into place but I rarely use them except on a very fine warp. I untie the next securing tie, then separate the two layers again back the next tie off point and continue until all is wound except the last tie point. I always leave the last tie in place and gently ease the last portion off the tension box and wind on the last portion by hand, being careful not to twist the bout but maintain the direction of the threads. I secure the end in place with a small piece of painters tape to hold in on the beam and then move the tension over the next spot and do it all over again. You are free to stop and walk away at any point and you are able to do it all by yourself with no helpers. Then I take my lease sticks and tape shut one end of the pair. I sit on a stool at the back of the loom and one by one, remove the tape and open the cross and slide onto my lease sticks in order. I'm careful to check the direction of the warps threads so not to twist them. (If you do this, it will have to be corrected later and it's easier to double check now!) When all bouts are on the lease sticks I tape closed the opposite end. I turn the lease sticks over the top of the back beam, then I take the brake off the rear pawl and rachett and so I am able to pull more of the warp forward. Try to do this positioned in the front and pull evenly till you have what you need. This is the one time where you might need a helper but once accomplished on your own, its fine after that. Apply the brake once more. I then secure the lease sticks to long cords that hang from the castle of my loom. I push them as close to the back of the heddles as possible. I remove the beater bar assembly from the front and also the breast beam. I will then sit at the front and pull each bout through, remove the last tie and smooth to detangle. When I'm sure that all is well, I will snip the loops securing the crosses and remove. I comb out the warp bout and then cut the looped ends at the bottom of the bouts all across the warp. I'm now ready to thread. There, I think that's more than enough for this post! At long last my kitchen towel warp finally came off the loom! (There was a lengthy delay weaving this off while my back injury healed) To repeat the details again: it is an eight shaft false damask, with two blocks. I chose to weave them alternatively throughout for a more balanced look. I used 2/8 cotton sett at 20 epi, which is normally a plain weave sett. Twills are best at 24 epi but with these towels, that meant a thicker hand to the cloth and that's not what I was looking for with a towel. The warp was ten yards long and I got nine large towels. No samples this time as I have woven this pattern before. I used three muted colours of a burnt peach, soft plum, and light khaki green with the dividing threads are black. The use of black seem to accentuate the colours and intensify them. (White tends to wash colours out) I have a black ceramic stove top in almond with black accents so thought to try black this time. I used some of the colours in the warp as weft ( plums, peach and khaki) and wove coloured borders on some and for the most part, just used one colour and no border at all. One towel is a plaid as an experiment and it a bit too busy for my tastes. That will go into my sale box. I normally weave some scrap yarn in between my towels and this gets trimmed off when I serge the edges of my towels. I find this minimizes the cloth from unraveling that is common with handwoven textiles. I take the towel to the ironing board and turn the serged edge over and press flat. Then turn and press again for small hem, pinning it as I go along. The pattern has the benefit of 'lines' to assist you. I have turned the picture so you can see my choice in irons. It's a Rowenta and has the right amount of weight and steam to make finishing projects much easier. A friend calls me the 'Queen of the Ironing Board' and I have tried a few makes and models and this one works for me. (I also have the Rowenta ironing board which is much wider than normal ones and adjustable up or down for a variety of heights.) Then I sew the hem by machine. Some like to hand sew hems but I prefer to machine sew towels and items that will be machine washed and dried for durability. Runner and 'dainties' I hand sew as they are normally hand washed. On three towels I used 2/16's mercerized black cotton as weft. It produced a lighter weight towel and it accentuates the warp colours. I also tried out using a green cottolin as weft. It's has a scratchier feel but should soften up in time. They make an impressive 'stack' and it feels good to be productive again. I have already have the next warp on and so we'll chat about that next post. This is the second part of my 'looking back' tribute. Then we'll resume more modern pursuits! 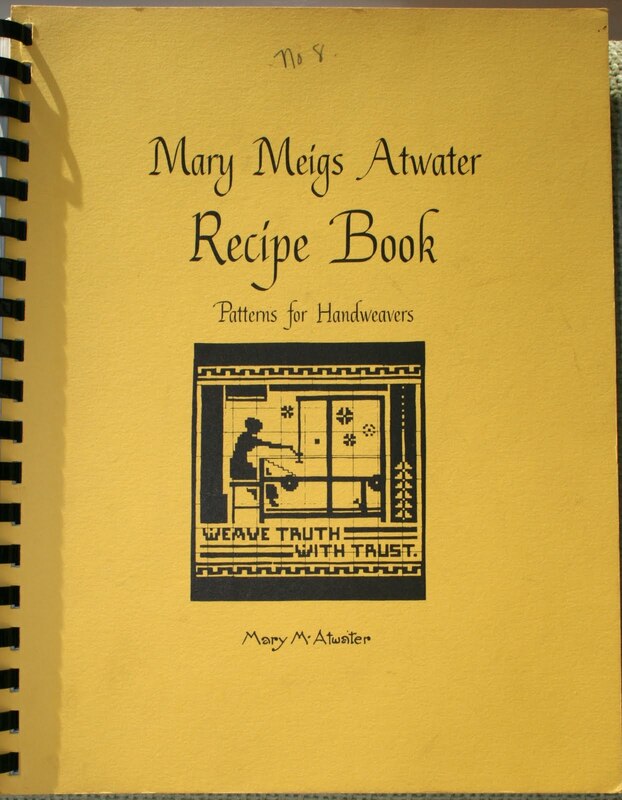 Mary Meigs Atwater taught Harriet Tidball weaving. I know that many of you will have books by Harriet on your shelves. But Harriet wasn't always a 'Tidball'... she was a Douglas first. 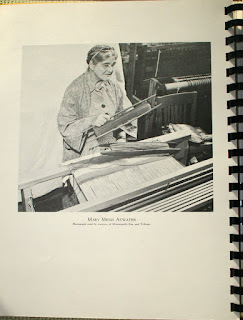 Mary Sandin, Ethel Henderson and Mary Black wrote the Loom Music series of weaving newsletters from 1944 to 1965 and were charter members of The Guild of Canadian Weavers . I'm the current past president of this Canadian national weaving organization. It was formed in 1947 and has just celebrated their 60th anniversary. But more on this group at another time. So now that you have twigged to the fact I'm a history buff, you can well imagine my joy when I went through the collection of books I bought in Victoria. At some point in the previous owners weaving life, she had acquired old books from the then retiring weavers of the day and so they kept passing these treasures forward. It was a collection of coverlets, in overshot and this was endorsed by the current President's wife, Eleanor Roosevelt. This picture is in the inside cover. 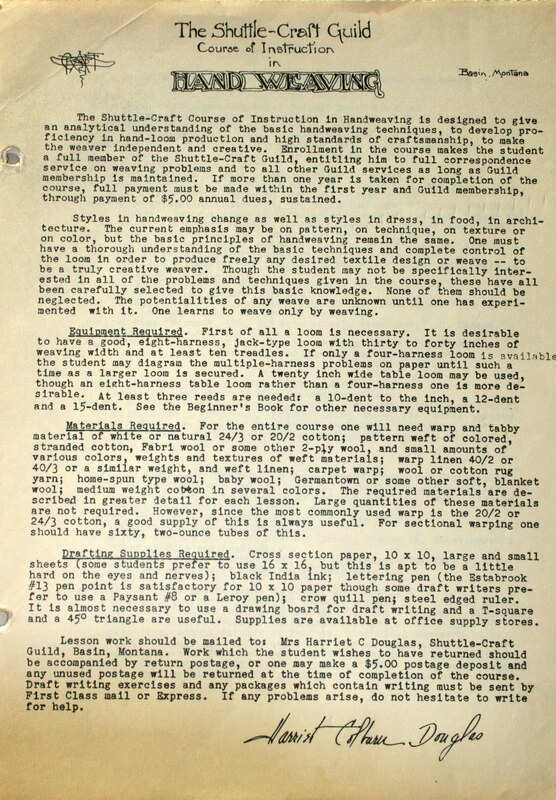 Even then, there were concerns about preserving this early weaving history. This was a program for a textile fair that at the time of this printing was into it's 7th season in 1945- 1946. In addition to the booklet was a folded sheet which gave the drafts of all coverlets on display. They were encouraging weavers to reproduce them and share. I have tried to show the size of the folder (above) and then a close up of the drafts. There was an old brown book at the bottom of the box when I was unpacking them at home. 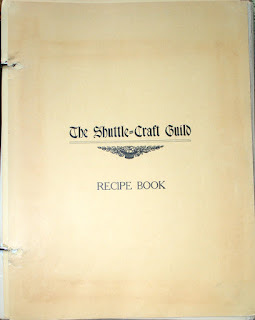 The title is a bit hard to read due to the fancy text but it reads " Dainty Work for Pleasure and Profit"
The book covers literally *everything* do do with womanly handicrafts of the day in 1902, including spinning and weaving. This book is more of a curiosity now and I'm keeping it because of it's venerable old age of 106 years. My towels have come off the big loom and a new warp is already on....we're back to the present in the next entry. I'm very sure that many of you have heard of Mary Meigs Atwater. 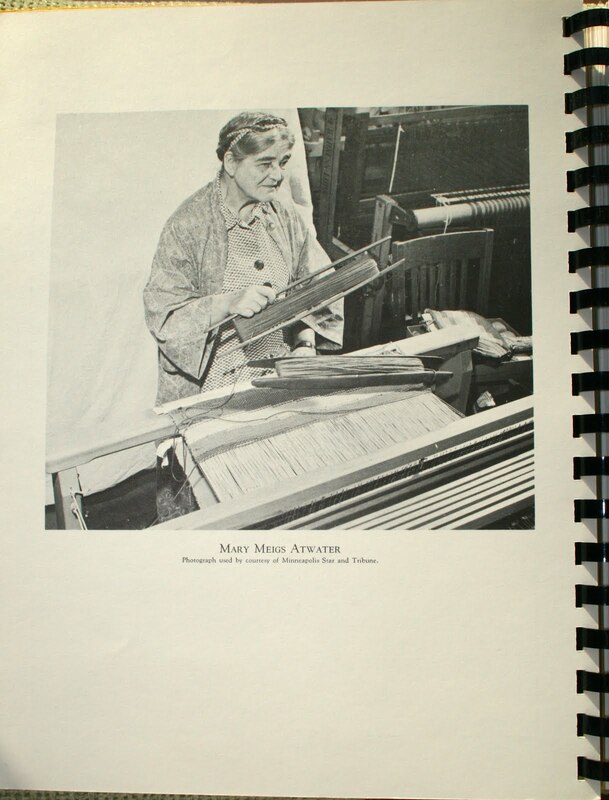 She was the power house behind revitalizing hand weaving from approximately the 1930's and well into the 1950's in the USA and Canada. 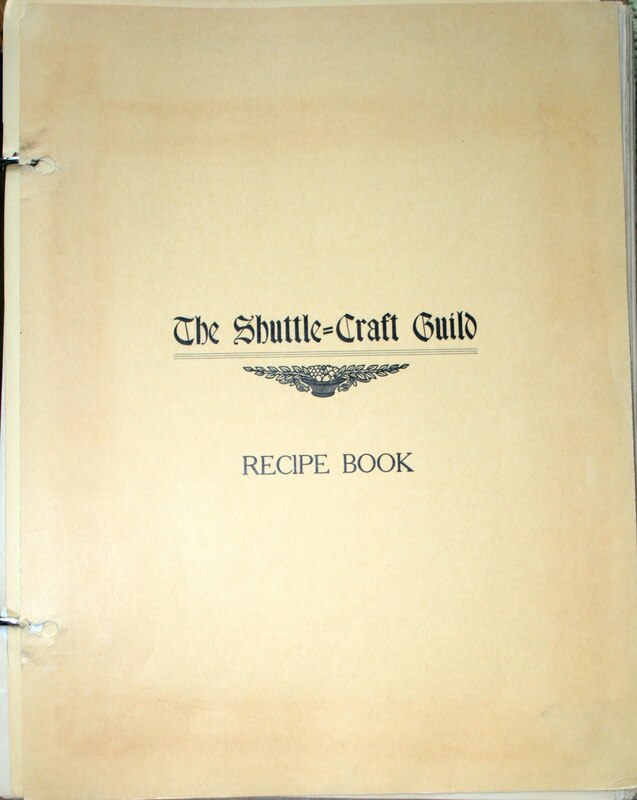 Ms Atwater was the principal author and owner of the Shuttle Craft Guild monographs, which are still in print. 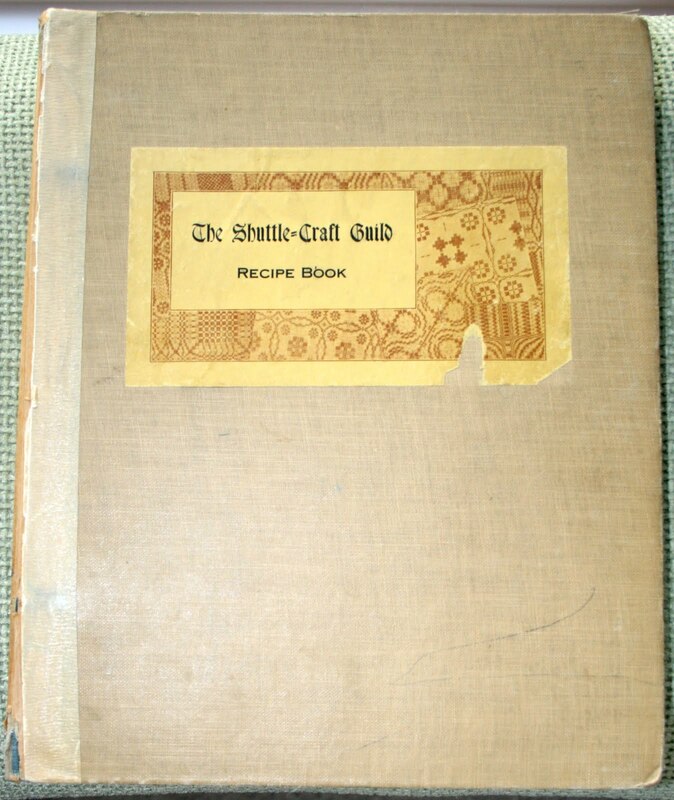 She was also the author of many well known weaving books that grace our library shelves today. I didn't pay too much attention other than knowing her name. A dear friend and weaving mentor gave me a gift prior to my moving away and suddenly I owned an old treasure and wanted to know much more! Some time later, a friend with a yarn business decided to retire and she sold her inventory to a wool processor and store. I went to see what was there and came away with two books. 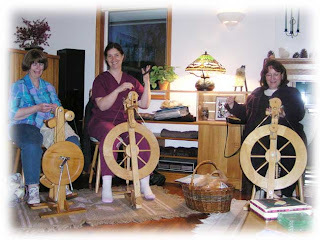 One was called " The Age of Homespun" about early colonial spinning and weaving in the young American colonies. The second was "Weaving a Life" as shown above. 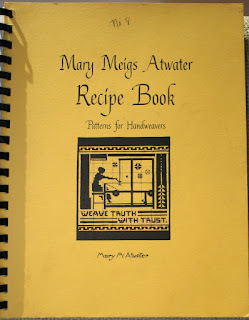 I read the book and was astounded to learn that Mary Meigs Atwater lived six full lives in her one! Her husband died young and she had to support herself and two children so she took up weaving and eventually taught classes. Her early years training as an artist in Paris meant that she had a beautiful way of drawing her drafts and a distinctive writing style. I won't say more about the story as I don't want to spoil it for you. But take my word, its a super read! The titles and text on these covers were done by Mary. I was fortunate to acquire these original monographs from the books and magazines recently purchased from the retiring weaver in Victoria. They are clear, concise and relevant to what we are looking for in today's weaving. 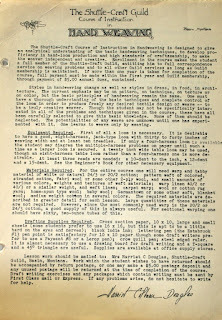 The Weaving Course alone is the complete set of long distance study material that she sent out to weavers in isolation. Weavers back then did not have the benefit of a local guilds, the yarns, equipment and Internet as we do today. Just a desire to learn and a love of the craft. Happily, that hasn't changed a bit!